NEW RELEASE! Nature's Song CD / DVD Combo includes a NEW CD of 15 of Mary Beth's captivating piano orchestral arrangements PLUS a NEW DVD of breathtaking videography of God's magnificent creation blended with Mary Beth's music. Perfect for relaxing on your own or to share while entertaining friends with not just background music, but also stunning videography of nature in all seasons! Nature's Song provides a comforting refuge that will refresh, energize, and expand your spirit! 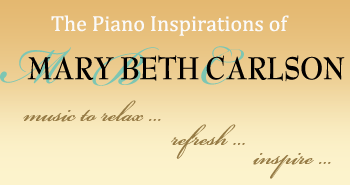 "God's beautiful handiwork and Mary Beth's beautiful piano playing, a great combination!!" "The weaving of songs is beautiful, and the landscapes behind the music enhances it all. How peaceful. Beautiful!" "As a music teacher, there is such a quality to your playing. As a Christian, there is such a spirit in your fingers ... love to listen to you. You are such a blessing." "My favorite sanctuary in which to praise and worship the Lord is in the midst of His miraculous creation. The exquisite beauty of nature inspires me to create music to honor and glorify its Creator. I hope each time you experience Nature's Song, your heart will be filled with gratitude for God's gift of creation and you will be blessed with renewed inspiration."